The far ultraviolet imager that the GOLD mission flies was built at the University of Colorado Boulder’s Laboratory for Atmospheric and Space Physics (CU/LASP). It has two identical and independent optical channels, each capable of performing every required measurement. These interface to the SES-14 spacecraft through a single processor assembly, which commands each channel independently. Images produced by the instrument are routed to a dedicated transponder for immediate downlink to an SES ground station. The raw images are stored at the ground station until transmission to LASP is confirmed. These are then sent over ground line to the University of Central Florida where high-level data processing converts the raw data into maps of thermosphere composition and temperature. 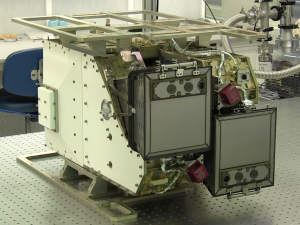 Each channel contains an ultraviolet spectrograph equipped with an imaging detector that covers 132 to 162 nm. 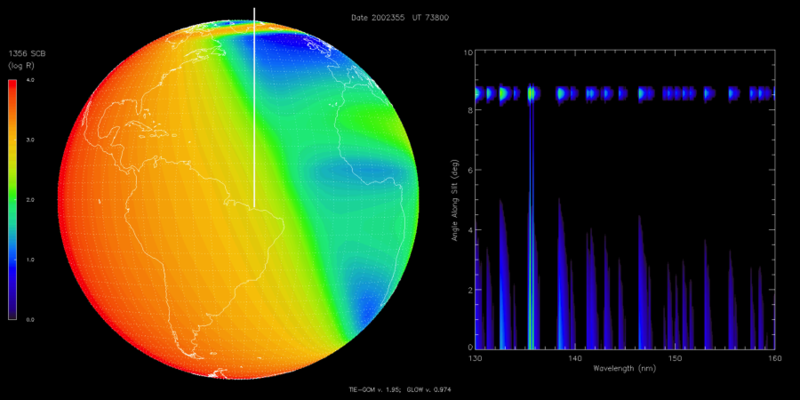 This wavelength range contains important emissions from the main constituents of the thermosphere—atomic oxygen (135.6 nm) and molecular nitrogen (the Lyman-Birge-Hopfield (LBH) band system 132 – 162 nm). Two selectable entrance slits, which are 0.2 mm and 0.4 mm wide, respectively, enable the two spectral resolutions of 0.2 nm and 0.4 nm required for measuring temperature and composition. The optical layout of a single channel is shown here in Figure 1. 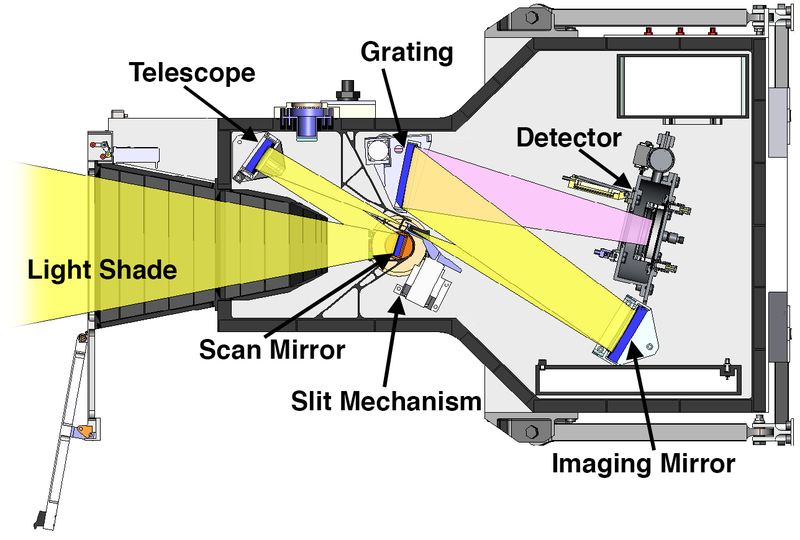 A single-mirror telescope equipped with a plane scan mirror images the spectrograph entrance slit onto the atmosphere. 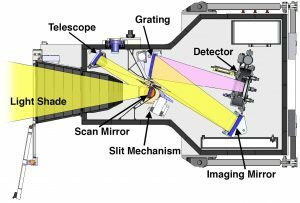 During an observation, a precision mechanism rotates the mirror so that the slit image sweeps east-west across the Earth’s atmosphere. The slit is only tall enough to cover a single hemisphere (either north or south). This is accommodated by tilting the mirror through approximately 4.5˚. In this configuration, one face of the mirror projects the slit onto the northern hemisphere and the other face projects it onto the southern hemisphere, as illustrated in the left panel of Figure 2. A third 2.6 mm wide entrance slit is used for stellar occultations. In this configuration, which is illustrated in the right panel of Figure 2, the scan mirror is positioned near the limb of the Earth and remains motionless as the star drifts through it. This enables GOLD to measure the absorption of starlight by the atmosphere in order to measure the density of molecular oxygen, which is a minor constituent of the thermosphere. The primary GOLD mission is scheduled for two years of operations with both channels performing measurements needed to meet the baseline science requirements and returning data sufficient to determine seasonal variability in the thermosphere and ionosphere.